I wish we had a drive-in movie theatre in our city. I’d love to pack up some snacks, blankets, pillows and my favorite pajamas and go to watch a movie with my family. Even without a drive-in movie theatre in your city, you can plan a fun Drive-In Movie Birthday Party at home! 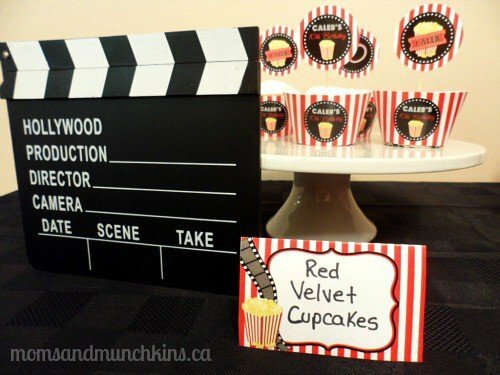 Here I’ll talk about some fun ways to turn your home into a mini drive-in movie theatre along with ideas for invitations, snacks, favors and more. 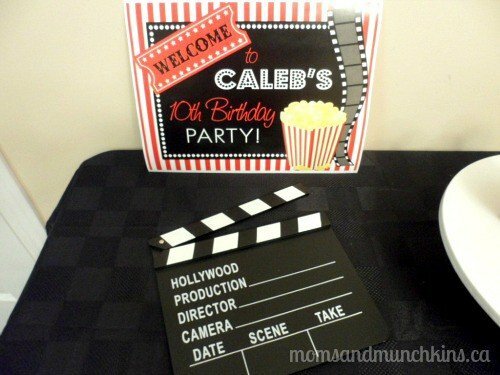 The printable party package featured here is by Dazzle Expressions. 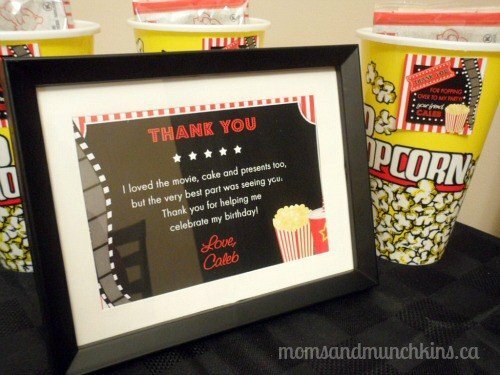 A cute idea for an invitation for a movie-themed party is a ticket. 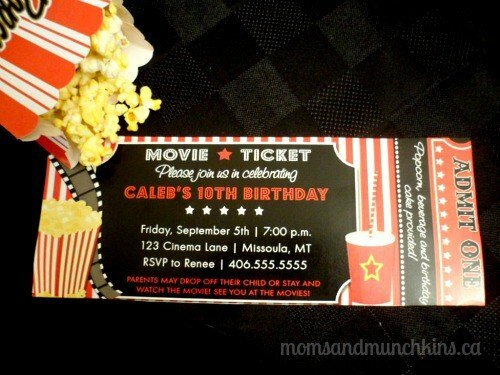 The ticket can be customized with your party information and could even include a photo of the birthday child. For a Drive-In Movie Birthday Party theme, you may want to add in something about guests being welcome to bring along their vehicles (bikes, wagons, scooters, etc.). A personalized welcome sign is a great way to welcome guests to the party. Did you ever make one of those popcorn garlands for your Christmas tree? A fun idea would be to create a popcorn garland to hang around the sign as guests enter the party area. 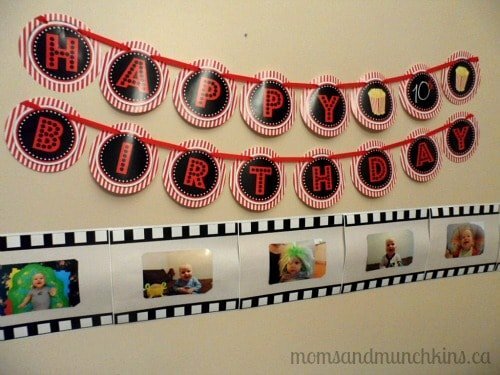 Everyone loves a personalized photo banner at a birthday party. It’s an adorable way to show how much your child has grown over the last year (or several years). 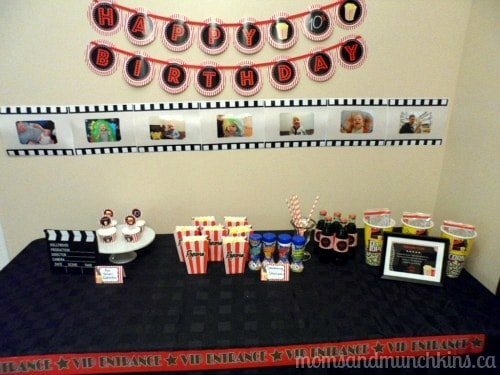 For a movie-themed party, a creative idea is to glue photos onto paper that looks like a strip of film. To set the scene for a drive-in movie, you can move furniture so that the little ones can all sit on the ground around the TV (perhaps in homemade cars – I’ll get to that activity idea in a moment). If you have a projection TV or someone you could borrow one from, you could set up a projection movie in your backyard that could start once the sun goes down. You need a vehicle in order to go to a drive-in movie, right? A fun activity idea for the kids is to have each of them make their own car out of a large cardboard box. If you give a store enough notice, they can save some large boxes for you to pick up before the party. Another idea is to get a few extra large boxes (like refrigerator size) and the kids could create little pickup trucks to sit in for the movie. This could include pillows and blankets to make the box cars more comfortable. An adult will have to be available for any work with scissors for this activity. Kids could be given black paper plates for wheels, yellow paper plates for headlights, markers to draw with, glue or double-sided tape to piece it all together and any other supplies you think they may need to create their own mini vehicles. Your food concession stand area could be set up like a red carpet arrival area with signs for VIP access. 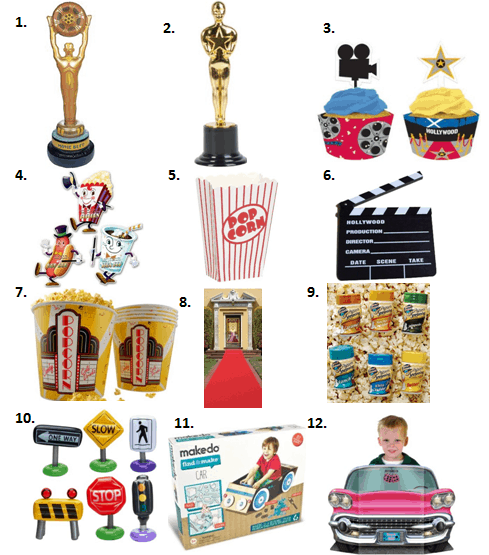 Kids could pose for pictures with movie type props in front of a simple backdrop (here are some easy backdrop ideas). Food for a Drive-In Movie Birthday Party is easy to prepare. 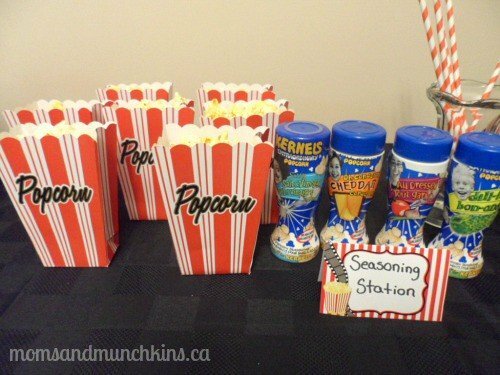 You can simply set up a concession stand area with food you would normally find at a theatre like popcorn, various candies, popcorn seasoning and pop. Your dessert could consist of cupcakes with personalized wrappers and toppers. You could also offer other popular concession stand items like slush drinks and frozen yogurt. Have you ever been to a drive-in movie theatre? 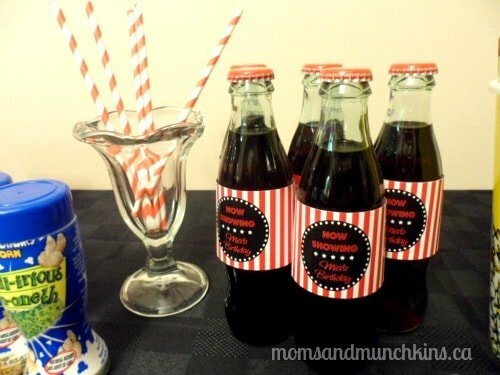 Here at Moms & Munchkins, we love a good party! We’re adding creative party ideas all the time and we want to share them with you. Join our communities on Facebook, Twitter, Pinterest and Bloglovin’. *Disclosure: Dazzle Expressions provided the printable party package to Moms & Munchkins free of charge. I am part of the Amazon affiliate program. All opinions expressed here are my own.